With high quality solid wooden box. No chemicals/ no residual contamination. Energy saving, only consumes 43 watt power. 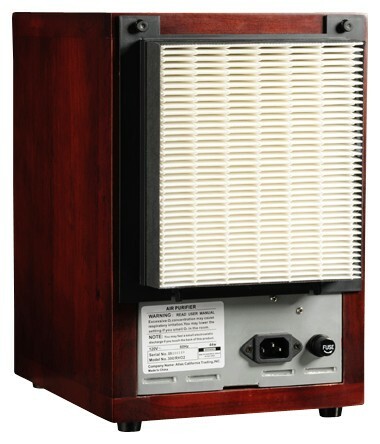 8.25" x 9.10" x 12.5"
The RHO2 is a compact and power-efficient, five-stage filtration system equipped to rid the air of odors, bacteria, allergens, and dust. The RHO2 oxidizes the air with its onboard ozone plates and negative ion generator to significantly reduce chemical gases, paint fumes, smoke and bacteria particles in the air by decomposing and eradicating contaminants.The UV light and photocatalyctic filter work together to neutralize molecules organic particles in the air which cause odors or could contaminate indoor air and aggravate allergies. 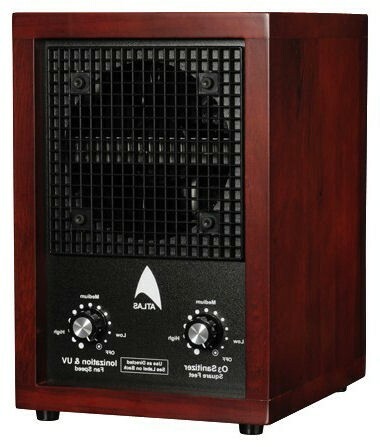 This compact and portable unit with its five stage filtration system helps kill bacteria with a UV light and a top-of-the-line HEPA filter that will eliminate pollen, bacteria, and create clean breathable air within a 3,500 sq ft area. It also comes with a washable HEPA filter for your convenience. Compare for yourself and see the difference! Cabinet Quality Solid natural hardwood, attractively stained. Cheap pressed wood, laminate exterior. 120% more effective! Less powerful. Removes 99.97% of particles down to 0.3 microns in size, almost 300 times smaller than the width of a human hair. Units rely solely on ions and ozone. Much less effective. Creates more effective ionization. Emits fewer ions. Remove the HEPA and plates slide in-out freely. No need to change the Hepa Filter (Washable) Must remove back of unit and then insert hand to remove or install plates. Need to purchase new Hepa Filter! Will not corrode from ozone Soft white metal that can corrode.